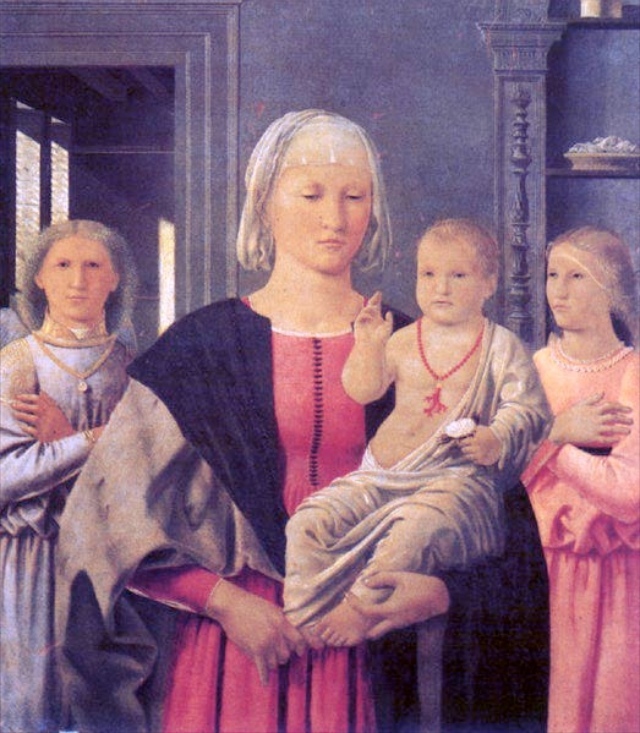 Art lovers who holiday on the Tuscany Umbria border are spoilt for choice when it comes to galleries and paintings, one painter, whose work you should try and see, is the Renaissance master Piero della Francesca. A mathematician and artist, Piero della Francesca spent much of his life working in the towns of the Tuscany Umbria border and the Renaissance court of mercenary soldier Federigo da Montefeltro in Urbino (in the neighbouring region of Le Marche). Determined fans of this remarkable painter can follow a Piero della Francesca Trail, taking in the towns of Arezzo, Sansepolcro, Monterchi, Urbino, Perugia and even Rimini on the Adriatic coast. A visit to the Uffizi Gallery in Florence can also be included in the Piero Trail as you will find his famous portraits of the aforementioned Duke of Urbino, Federigo di Montefeltro and his wife, Battista Sforza. 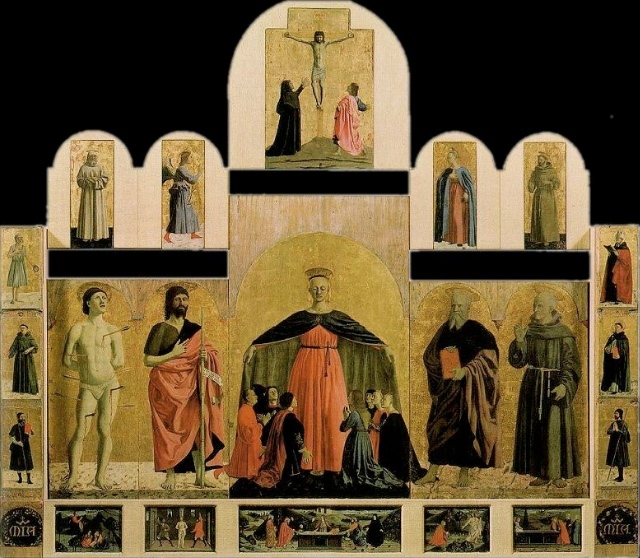 The Piero della Francesca Trail forms the background to John Mortimer’s novel Summer’s Lease, if you haven’t already read it and you are interested in following the Piero Trail, it’s worth bringing a copy for holiday reading. The faces in Piero della Francesca’s painting display an unusual lack of emotion, the solid figures draw their inspiration from classical sculpture and seem to be frozen in a moment in time. In 1897, the art critic Bernard Berenson wrote “Impersonality – that is the quality whereby (Piero) holds us spellbound, that is his most distinguishing virtue”. Proof of the Cross – detail, note the repetition of the faces. 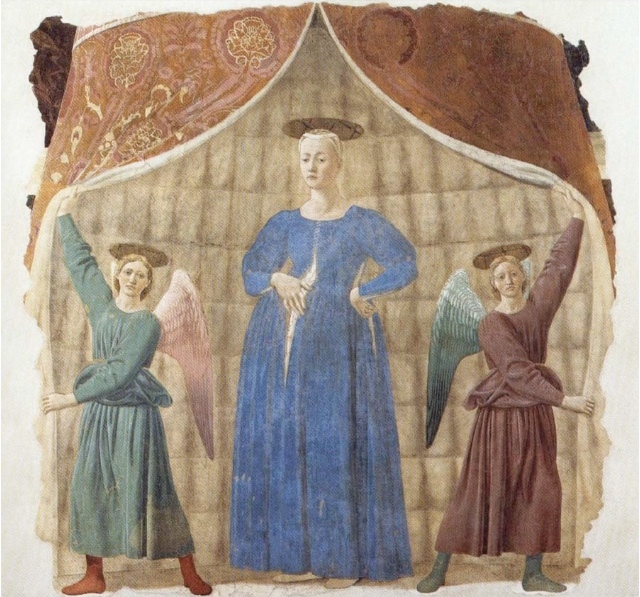 Piero della Francesca, Arezzo. The same faces reappear throughout the paintings, and are sometimes repeated within the same scene with altered characteristics such as facial hair. Perhaps it’s stretching things a bit far to claim that this repetition influenced the Pop Art of Andy Warhol, but the overall effect is quite modern in style. The mastery of perspective and foreshortening in Piero’s painting is incredible. 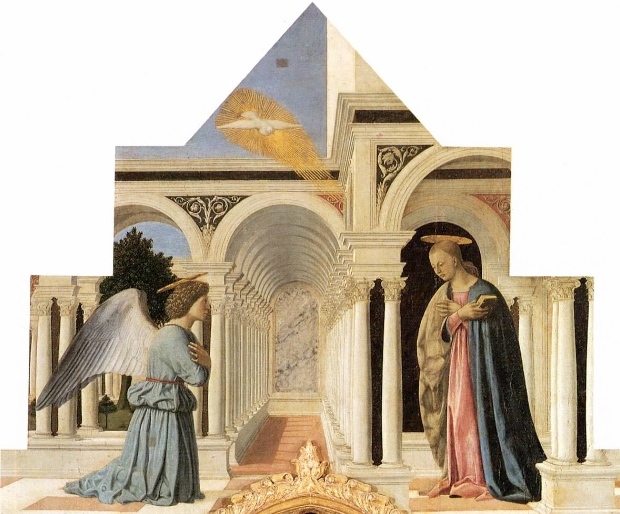 In true Renaissance Man style, Piero della Francesca was also a mathematician as well as an artist and the study of perspective naturally interested him, often the pictures depict Renaissance architecture and intricate floor patterns that show off his skill. The Legend of the True Cross in the church of San Francesco – book in advance as spaces are limited. A medieval tale telling the story of the cross on which Jesus was crucified and it’s magical properties throughout the centuries. It starts with the death of Adam and the planting of the acorn in his mouth, it ends with the defeat of the Persians by the Byzantine Emperor and the return of the cross to Jerusalem. Restored in the 1990’s, these vivid pictures are a “must see” on a trip to Arezzo. The Resurrection, still in it’s original position and the Misericordia Polyptych are on display in the Museo Civico within the walls of the old town. 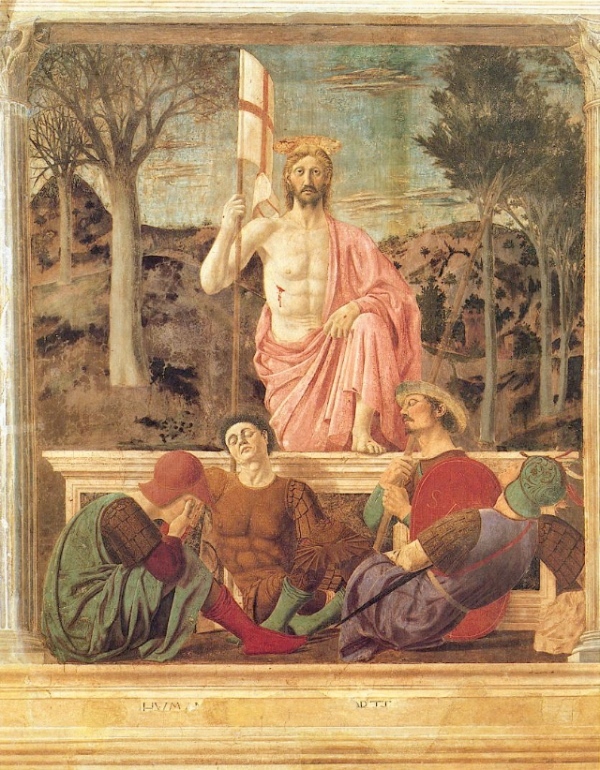 Described by Aldous Huxley as the “worlds greatest paining”, the Resurrection shows Christ rising from a tomb while guards sleep beneath him. The pink tinged clouds reflecting the light of the rising sun and the bare trees on one side of the painting but in full foliage on the other are symbolic of renewal. The soldier second from the left is said to be a self portrait of Piero della Francesca. The Misericordia Polyptych is remarkable in that the traditional medieval style with a flat gold leaf background actually enhances the solidity of the figures, which, unlike medieval paintings, are painted in perfect perspective. Depicting an unusual subject, the heavily pregnant Madonna del Parto could easily have been lost during the Counter Reformation when it would have been considered inappropriate. It now costs €5.50 to get in to see the Madonna del Parto, making it an expensive entry ticket to see a single painting, For those that are interested, you also get access to Monterchi’s museum of scales and balances with the same ticket. However, if you have never seen it, it is worth gritting your teeth and paying the extortionate entrance fee, this seemingly simple painting will stay in your memory for years to come. In the Ducal Palace in Urbino you can see two paintings by Piero della Francesca, the Flagellation of Christ and the Madonna di Senigallia. The Flagellation is the subject of much debate, what are the three men on the right talking about? Why are they ignoring the scene in the background? There are two sources of light in the painting, the interior is illuminated from the right and the exterior of the building from the left, does this mean that the two scenes are occurring at different times? The Madonna di Senigallia (shown at the start of this post) is influenced by artists from the Low Countries who depicted biblical scenes in ordinary contemporary settings. 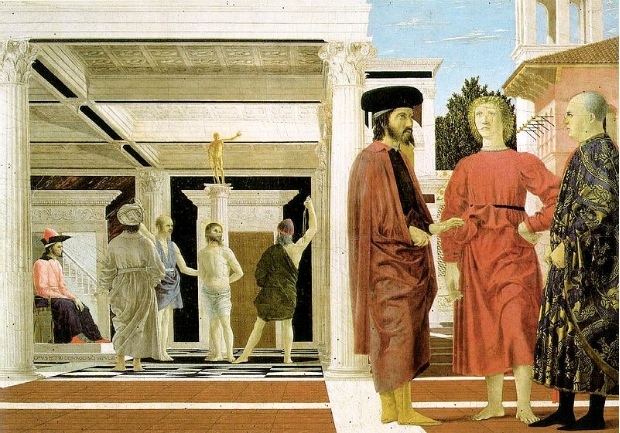 Piero della Francesca would have met northern European artists at the court in Urbino. One of the masterpieces in the collection of the National Gallery of Umbria, the Polittico di San Antonio has a remarkable Annunciation, the perspective of columns in the background draw your eye to the back of the cloister. 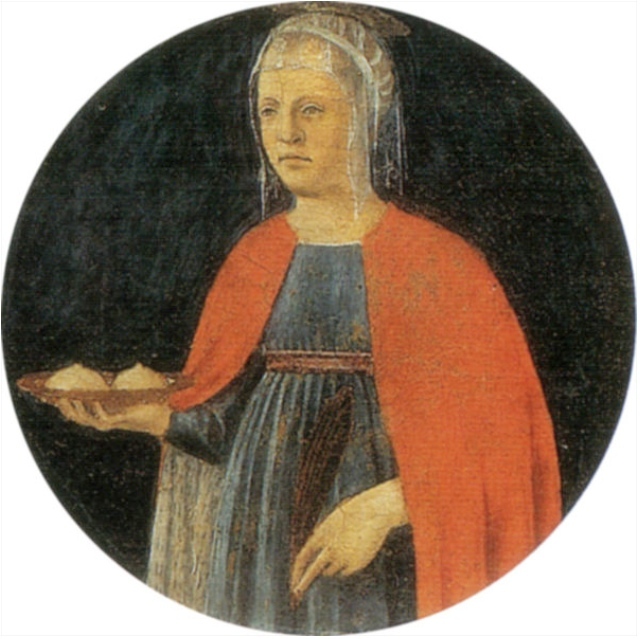 Look out lower down for St. Agatha, holding her breasts on a plate. In the Adriatic town of Rimini, Piero della Francesca met another famous Renaissance man, Leon Battista Alberti, an architect and mathematician. Alberti started to remodel the 13th Century church of San Francesco as a Renaissance building, now known as the Tempio Malatestiano. 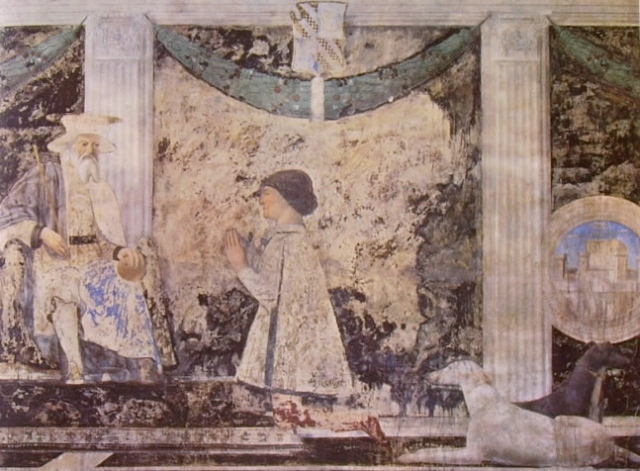 The redesign was never finished but Piero della Francesca left this painting of Sigismondo kneeling in front of his patron saint. 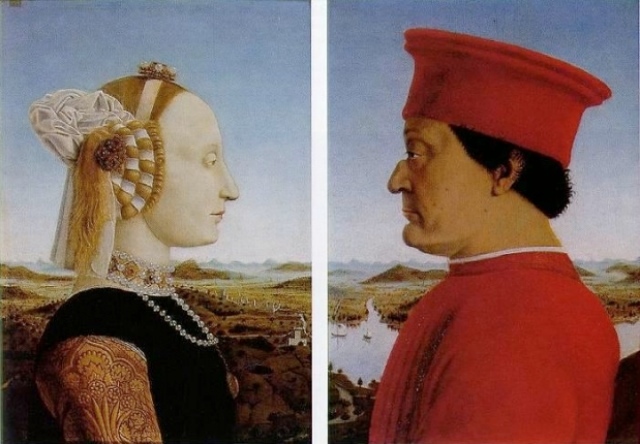 In the Uffizi Gallery in Florence you can see the portraits of the successful mercenary soldier Federigo da Montefeltro, Duke of Urbino, and his wife Battista Sforza. In the background of his wife’s portrait it is thought that the town is Gubbio in Umbria where the Duke built a Renaissance palace. Most books will tell you that the Duke lost an eye and part of his nose in a jousting accident, however, I overheard a guide at the Uffizi saying he had the top of his nose removed after the accident to improve his vision. The side on profile may have hidden his missing eye but it also copied the profile of Roman Emperors on coins, something the Duke would have been keen to allude to.